We’d love your help. 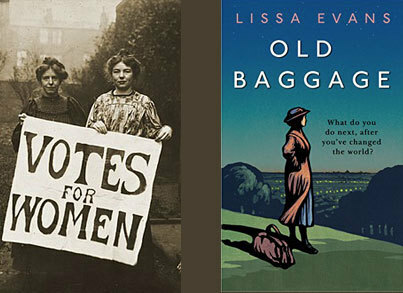 Let us know what’s wrong with this preview of Old Baggage by Lissa Evans. 1928. Riffling through a cupboard, Matilda Simpkin comes across a small wooden club—an old possession that she hasn’t seen for more than a decade. Immediately, memories come floodin The author of the acclaimed Crooked Heart returns with a comic, charming, and surprisingly timely portrait of a once pioneering suffragette trying to find her new passion in post-WWI era London. To ask other readers questions about Old Baggage, please sign up. Does anyone else feel that the blurb underplays his novel? Makes it sound less important than it is? Matilda Simpkin is living in 1928 London. She’s found a wooden club, something she hasn’t seen for a while, and along with it comes the memories she associates with that item. You see, Mattie was a suffragette years earlier. She was jailed five times and was quite the spitfire. She longs for that excitement and purpose again. She finds her life boring by comparison now. Mattie runs into an old friend and fellow suffragette who is fighting for Fascism. This gives Mattie an epiphany; she needs to engage the younger generation of women via founding the Amazons. The purpose of the group is for the women to exercise, both in body and in mind. Everything is running smoothly, and Mattie is happy with the group’s purpose when a new member joins that brings in Mattie’s past, things she doesn’t want to address. I loved this quirky and fun story. Mattie is a brilliant and charming main character. She’s formidable and fights hard for her life passions. She’s a leader and isn’t afraid to say and do the hard things. How inspiring is that? She made me think and feel and those are the things I love most in a main character. It is intriguing and thought-provoking to consider after good portions of their lives dedicated to endlessly fight for the right to vote, what did these women go on to do, once voting rights were granted? How does one find purpose again after a victory won in that way? It's 1928. Matilda Simpkin, rooting through a cupboard, comes across an old wooden club - an old possession of hers, unseen for more than a decade. Mattie (Matilda) was a militant during the Women's Suffrage Campaign. She has given speeches, marched, smashed windows, she's even heckled Winston Churchill. You name it and Mattie has probably done it. She's even been jailed five times. Twirling the wooden club, she has an idea, but is it a good one? Mattie feels she has no purpose in life. She's now It's 1928. Matilda Simpkin, rooting through a cupboard, comes across an old wooden club - an old possession of hers, unseen for more than a decade. Mattie feels she has no purpose in life. She's now middle aged and feels she is seen by others as old baggage. When Mattie meets an old suffragette friend who is now a facist, Mattie decides to take on a new challenge. Although this story can be a bit slow in oaerts, it can also be engaging and funny in others. It is quite informative on the facts about the suffragettes lives. You can't help but like Mattie, a wonderful character. She makes mistakes but is not afraid to fight for what she believes in. Mattie Simpson has appeared in a previous novel, “Crooked Heart,” and I was delighted to meet up with her again. It is 1928 and Mattie is living in Hampstead Heath with Florrie Lee, ‘the Flea.’ Both were heavily involved in the suffragette movement and Mattie still gives talks about women’s rights. The story begins when Mattie, striding across the Heath, has her bag stolen. Attempting to stop the thief, she accidentally hurts young Ida Pearse, who later threatens to press charges, due to loss of Mattie Simpson has appeared in a previous novel, “Crooked Heart,” and I was delighted to meet up with her again. It is 1928 and Mattie is living in Hampstead Heath with Florrie Lee, ‘the Flea.’ Both were heavily involved in the suffragette movement and Mattie still gives talks about women’s rights. The story begins when Mattie, striding across the Heath, has her bag stolen. Attempting to stop the thief, she accidentally hurts young Ida Pearse, who later threatens to press charges, due to loss of work. Flo manages to smooth things over and offers Ida work in their house – especially as she has had more than enough of their daily, Mrs Bowling. This is a clever, thought provoking novel. I enjoyed reading about the indomitable Mattie and it did make you think about what the suffragettes (and indeed, suffragists) did once the vote had been won. A nice novel to celebrate the 1918 centenary and full of great characters. I received a copy of the book from the publisher, via NetGalley, for review. 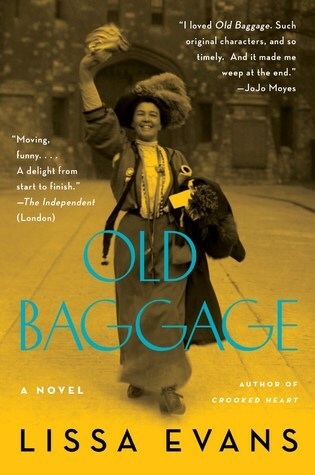 In many ways the title, Old Baggage, gives a clue to themes explored in the book. For example, some of those who come into contact with Mattie Simpkin, with her no-nonsense attitude and forthright manner, would probably regard her as a bit of an ‘old baggage’. Mattie believes in the benefits of physical exercise, the great outdoors and that, despite the changes brought about by the women’s suffrage movement, the fight needs to carry on if women are to achieve true equality. As she says: “The bat In many ways the title, Old Baggage, gives a clue to themes explored in the book. For example, some of those who come into contact with Mattie Simpkin, with her no-nonsense attitude and forthright manner, would probably regard her as a bit of an ‘old baggage’. Mattie believes in the benefits of physical exercise, the great outdoors and that, despite the changes brought about by the women’s suffrage movement, the fight needs to carry on if women are to achieve true equality. As she says: “The battle is not yet over; every day brings fresh skirmishes.” The reader can’t help but admire Mattie’s spirit, whilst at the same time admitting it might be quite exhausting to live with her. Luckily Mattie has Florrie, nicknamed The Flea. I defy anyone not to fall in love with Florrie who is, to my mind, the most sympathetic figure in the book. Her contribution to making the lives of women better is achieved through actions rather than words. In her role as a health visitor, she dispenses practical advice about domestic problems and the rearing of children to women often living in poverty and poor housing. Florrie is Mattie’s most loyal supporter, her self-appointed ‘shield-bearer’. Florrie understands Mattie’s moods and is able to exercise a restraining influence on her wilder schemes, schemes that, as with early motor cars, often require ‘someone to precede her with a red flag’. There’s plenty of emotional ‘old baggage’ in the book too. The legacy of past actions from their campaigning days in the suffragette movement looms large in the lives of some of Mattie’s and Florrie’s comrades. The government’s response to their protests – imprisonment, force-feeding – has wrought physical and psychological damage in some cases. In addition, Mattie discovers an unexpected legacy of those years much closer to home – ‘a hand from the past, reaching out to grasp hers’. In trying to set right what she sees as the mistakes of the past, she acts in a way that is completely out-of-character and that will have unforeseen consequences. Unfortunately, what Mattie doesn’t realise is that she’s not the only one with emotional ‘old baggage’. I enjoyed the setting, the characters and the historical references (suffragette movement), but the plot didn't quite do it for me. Absolutely loved this story. Read this for the prompt for “inter war Europe” for (Reading Through the Ages). Story of a former suffragette who in 1928 feels herself at a bit of a loose end. What do you do once the fight seems over? Clearly you go and find a new battleground. In my head this will be on the Walter Scott longlist at least. I've finished Old Baggage and I am bereft! This is beautiful, beautiful writing with characters that live and breathe. I loved Mattie in Crooked Heart. How wonderful to spend more time with her. I just hope we meet her again. This is a gorgeous, warm novel and I can't recommend it enough. Review to follow very shortly on For Winter Nights. It’s been a few years since I read Lissa Evans’ excellent novel “Crooked Heart”, but I remember loving her vivid characters and witty writing style. So when I heard that her new novel is a prequel to this earlier book I become intensely curious. “Crooked Heart” opened with a poignant description of Mattie, an aging intellectual who was very active in the Suffragette movement, before describing the journey her ward Noel takes out of London to escape the The Blitz in 1940. 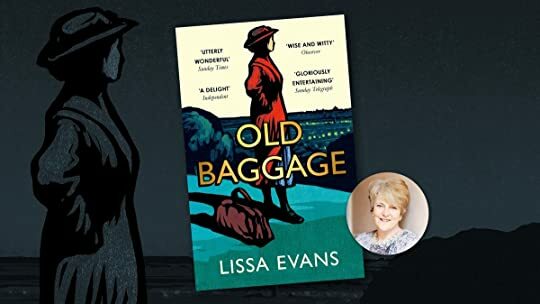 “Old Baggage” tells Matt It’s been a few years since I read Lissa Evans’ excellent novel “Crooked Heart”, but I remember loving her vivid characters and witty writing style. So when I heard that her new novel is a prequel to this earlier book I become intensely curious. “Crooked Heart” opened with a poignant description of Mattie, an aging intellectual who was very active in the Suffragette movement, before describing the journey her ward Noel takes out of London to escape the The Blitz in 1940. “Old Baggage” tells Mattie’s story prior to when the boy Noel came to live with her and depicts Britain at an interesting stage of its political history. I enjoyed the lively writing, and the light weave of feminist history. Otherwise, a humongous disappointment: what could have been a profound exploration of personal and political reinvention in the lives of aging suffragettes devolved into a silly, bloated story with all the nuance of a TV movie for children, crowded with underdeveloped characters and stripped of any power by the inanest of moral lapses at the center of its ridiculous plot. An absolute delight. I adored it in all the ways. In Matilda Simpkins, there is a character with so much depth and background to explore - it's just that she has reached a point in her life where her past was a million more times exciting than her present! She used to be part of the suffragete movement and her time fighting for the rights of women saw her jailed a number of times, attending numerous marches and even heckling Churchill. And now in middle age she finds nothing even comes close to recreating that buzz an What an astonishing book!! In Matilda Simpkins, there is a character with so much depth and background to explore - it's just that she has reached a point in her life where her past was a million more times exciting than her present! She used to be part of the suffragete movement and her time fighting for the rights of women saw her jailed a number of times, attending numerous marches and even heckling Churchill. And now in middle age she finds nothing even comes close to recreating that buzz and spark in her. The only enjoyment she seems to get out of life nowadays is passing on advice to neighbours - whether they want it or not!! When she finds herself under the watch of the police again after a street robbery, she soon finds a new way of feeling involved in the world and inspiring a new generation of young girls to be educated and feel inspired to think more of themselves as she starts a Girls Club on Hampstead Heath, teaching them a variety of skills. There are a number of other important characters we get to meet along the way - from Florrie 'The Flea' who lives with Mattie and is a dear friend and a calming influence on her friend, to Ida who is a young girl whose family expect very little from her other than to cook for her brothers at home, and they tease her when she shows an interest in wanting more out of life and for herself. I found this to be such an inspiring read. We take so much for granted nowadays as women and it is always eye-opening to go back and look at the struggles women went through and to have a character of Mattie who is fearless, most of the time, is really enlightening and stirring. Mattie and Florrie have many times when their friendship is tested, there are fallings out, but it showed beautifully the bond they do share that when times are tough they are there for one another. My first five star read of the year! A delight! Lissa Evans in a genius when it comes to characterization. No one can touch her. Stop and think about this title of the latest book from Lissa Evans. Old Baggage, can mean different things to different people. It can be used as a description of some older lady, past her prime and of no use to anyone or society. It can be the baggage we bring from the past into the present. It can be actual tangible items, it can be thoughts, emotions and feelings. It can simply be an old bag with treasures inside that has sat unopened for a long time. But what if it is all those things as Liss Stop and think about this title of the latest book from Lissa Evans. But what if it is all those things as Lissa Evans cleverly weaves her tale. Matilda Simpkin, Mattie to her friends is all the things I have described and more. She is a lady of a certain age, who having been a militant activist within the Suffragette movement has now reached a stage in life where she finds she is of no use, she has no purpose. She is simply seen by others as Old Baggage. But upon discovering a wooden club in an old bag, she wonders perhaps if there is still not more to do and can you still be idealistic and principled ten years after the main event. However, times have changed and they are moving in a different direction and when Mattie encounters someone from her past what she believes in suddenly becomes lost in some other campaign. I was drawn to all the characters, even though Mattie dominates the pages. Those she interacts with like The Flea (read the book to find out why she is called that) and young Ida who they both take under their wing. Mattie sees Ida as the future but, Ida sees a very different future and Mattie needs to change that, she did not fight for no reason. This is a enthralling read, which did make me stop and think what became of the suffragettes and this is an ideal book to celebrate the centenary of those who fought so I can have a vote. I enjoyed all the historical aspects of it and how I was taken back to the cells of Holloway and reminded that it was another ten years before all women had the vote. This was such a joy to read and extremely apt and poignant in the year we’re all supporting and remembering what these woman did for us. These were the early days of feminism and women’s rights but it’s told in such a poignant, warm witty way that it feels like you’re stepping into a sepia photo, a moment in history with some of the loveliest women I’ve met in a book. I really wanted them to pop by for a cup of tea after I’d read it, I missed them so much! Lissa Evans has really achieved something special with this book. It’s packed full of information woven into a charming tale so you never feel you’re ‘learning’ but you do feel so much wiser and enlighted by the end. Curious even and that’s no bad thing with a subject matter as important as this one. An enjoyable tale of a suffragette trying to find new purpose in life once the vote for women has been won. I liked the main character very much and enjoyed the witty dialogue but felt that the overall story lacked a certain narrative drive. Overall though, a good light "up-lit" read. 3.5 stars, raised to 4. The story of an elderly suffragette who now leaves a comfortable life decides to leave that comfort behind and get out there and continue to make a difference. Maybe I didn’t give it long enough but such a powerful subject matter needed to be more engaging. The writing was well done and the historical research was evident but it was, unfortunately, a bit dry. In Lissa Evan’s previous novel, Crooked Heart, the reader is briefly introduced to Mattie Simpkin, an elderly lady who was once a suffragette. Old Baggage is set a decade earlier and offers further details on the life of this idiosyncratic character. Neither book relies on the other for its story but, having enjoyed the earlier work, I was delighted by the links that exist. The tale opens in 1928. Mattie is walking across Hampstead Heath when she is assailed by a memory, her momentary distraction In Lissa Evan’s previous novel, Crooked Heart, the reader is briefly introduced to Mattie Simpkin, an elderly lady who was once a suffragette. Old Baggage is set a decade earlier and offers further details on the life of this idiosyncratic character. Neither book relies on the other for its story but, having enjoyed the earlier work, I was delighted by the links that exist. The tale opens in 1928. Mattie is walking across Hampstead Heath when she is assailed by a memory, her momentary distraction enabling a thief to make off with her handbag. In attempting to waylay the malefactor she injures a girl who then threatens legal action. Mattie’s good friend, Florrie Lee, steps in to help, offering the girl, Ida Pearse, a position in the house where she lives with Mattie. Florrie works as a Health Visitor and is the more practical and empathetic of the pair. She grew up in a poor household whereas Mattie came from a wealthy family. This disparity is more significant than Mattie can realise. The causes she cares about are linked to female equality and aspiration which can be stymied by family circumstances as much as legislation. Mattie is not the only suffragette looking to influence the young people of London. The idea for the girls’ club was inspired by an encounter with another old friend whose outlook has moved towards Fascism. The two groups, which the ladies set up, hold their meetings on the Heath and soon become rivals leading to a confrontation. Mattie has been foolish in her dealings with the attendees at her club – favouring one for personal reasons – with cataclysmic results. The minor plot threads and contextual references add depth to what is an entertaining and accessible story. Mattie is a wonderful character, her drive, intelligence and willingness to take responsibility for her headstrong actions and their consequences an inspiration. Florrie offers a different perspective, quietly supporting and mopping up after her friend. The varied milieu offer a stark reminder of the importance of the welfare state. It takes skill to write a book that is congenial and captivating whilst offering the reader interesting topics to chew on. The attributes and actions of the characters demonstrate how multifaceted an individual can be, and how often one judges on incomplete information. Old Baggage is funny, tender, fervent and affecting. It does not shy away from important issues but neither does it preach. It is a joy to read. I had this book sat on my kindle for some time before I got around to reading it, but once I started I couldn't put it down and read it in three sittings over less than 24 hours. It centres around a militant suffragette, Mattie, and 'what came next' after the vote had been won and after it was clear that it was going to be extended equally to all men and women. Mattie is a wonderful character, larger than life in many ways, loud, slightly obnoxious, with no real empathy, but with an energy, dedi I had this book sat on my kindle for some time before I got around to reading it, but once I started I couldn't put it down and read it in three sittings over less than 24 hours. It centres around a militant suffragette, Mattie, and 'what came next' after the vote had been won and after it was clear that it was going to be extended equally to all men and women. Mattie is a wonderful character, larger than life in many ways, loud, slightly obnoxious, with no real empathy, but with an energy, dedication, humour, and a zest for life. She doesn't really see her flaws at first, but as the story progresses she becomes very aware of the mistakes she has made and their consequences. The book is well written with all the characters being well enough drawn to be distinguishable and with enough empathy from the writer to make us like many of the supporting cast, both young and old. I loved The Flea especially and would like to know more about her life, and about what happened to Ida and Inez, as well as to the boy and Mattie. The only real negative about the book is the way that in places, especially towards the end it skips forward in time and we miss things I'd like to have seen more of, however maybe that would have detracted from the main story. Oh what a cool and clever book, a jolly hockey sticks sort of book! The story begins in 1928, and the central character is Mattie Simpkin, a former suffragette. Mattie is delightful, intelligent, flawed and bored, and now that women have been granted the vote, Mattie is looking for another challenge in her life. Much of the story is set around Hampstead Heath, where Mattie lives with her dear friend, affectionately know as "The Flea". I loved the jaunty style of writing, lurching along from event Oh what a cool and clever book, a jolly hockey sticks sort of book! I loved the jaunty style of writing, lurching along from event to event, often in a hilarious way. But there's also much to learn about the life and times of the Suffragettes, and the sacrifices that these women made. Atrociously poorly written, and containing intact, several-page-long lectures where you're invited to sit and listen to a flat character deliver schoolroom speeches on feminism, complete with slides. I thought this was probably a children's writer, and it turns out she is. I only hope her kids' books have more sparkle than this. Waterstones book of the month, no less. A thoroughly lovely read, easygoing and uplifting. I can imagine rereading this book very soon. Light easy read, Mattie is a middle aged woman who was a suffragette. She fights for what is right but sometimes her judgement takes her down the wrong lane. I fell in love with the characters in this book. Real, rounded, flawed, lovable characters that I'm still thinking about two days later. Also, I loved the sense of time and place. It's immaculate. The other thing I really like is the way that Lissa Evans doesn't spell everything out for us. She moves forward in time and we intuit what's happened in the gap. She throws in an aside and we make the connection without her repeating it or having a character clumsily spelling it out for us. I love it w I fell in love with the characters in this book. Real, rounded, flawed, lovable characters that I'm still thinking about two days later. Also, I loved the sense of time and place. It's immaculate.